For the 50th anniversary in 1997 of the original novel, only the month before Henry's death, Simon & Schuster released a diary garnished with quotations from Misty of Chincoteague and new illustrations by Bill Farnsworth (Little Simon, October 1997); ISBN 9780689817694. Windy of Chincoteague by Ronald Keiper (1987) — small non-fiction book about Misty's first granddaughter Windy. Pony Promise by Lois Szymanski (1996) — fiction, but based on the true story of Windy nursing her half-sister Misty II along with her own foal Cyclone, because of Stormy rejecting Misty II. Nightmist the Miracle Pony by Jessie-Ann Friend (2005) — children's book about Misty's great-grandson Nightmist. The Forgotten Pony by Jessie Ann-Friend (2007) — children's book about Misty's great-grandson, Rainy's Boy. 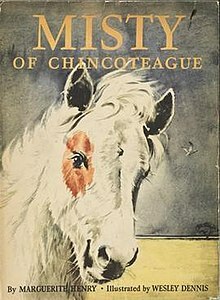 ^ a b c d "Misty of Chincoteague" (first edition). Library of Congress Online Catalog. Retrieved 2015-02-16. ^ admin (30 November 1999). "Newbery Medal and Honor Books, 1922-Present". Retrieved 21 October 2016. ^ Misty at the Internet Movie Database. ^ "'Misty of Chincoteague' tale gallops on Horse: Marguerite Henry, who died recently, wrote 59 books, but her tale of two orphans and a horse remains a breed apart". Retrieved 21 October 2016. ^ "Island Theatre - Chincoteague Chamber". Archived from the original on 14 April 2010. Retrieved 21 October 2016. ^ "Misty's Heaven: Descendants of Misty of Chincoteague". Retrieved 2015-07-27. ^ "Era Draws To Close At Home Of `Misty'". Retrieved 21 October 2016. ^ "Sea Star: Orphan of Chincoteague" (starred review). Kirkus Reviews. No date. Retrieved 2015-02-14. ^ Misty's Twilight". Kirkus Reviews. June 15, 1992. Retrieved 2015-02-14. Wikimedia Commons has media related to Misty of Chincoteague.